The finger of land at the edge of the San Diego Bay called Point Loma seems like the perfect site for a lighthouse. In fact, the word loma means hill, and you can understand why folks in the 1850s chose the location. At the time it was built, the Point Loma Lighthouse had the highest elevation of any lighthouse in the United States. As it turned out, putting a lighthouse on top of a 422-foot-tall cliff wasn't such a good idea. Fog and low clouds kept ships from seeing the light just when they needed it the most. To help them, lightkeepers resorted to shooting a shotgun into the fog to warn vessels away. By the 1890s, it became apparent that something should change. The lighthouse was closed and a new one built at a lower elevation. That makes Point Loma the only place in California where you can see not one but two lighthouses in the same place. 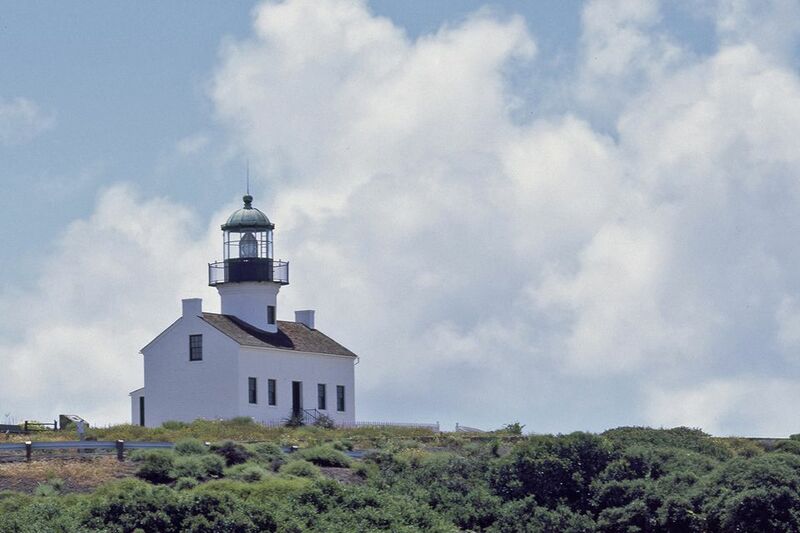 The original Point Loma Lighthouse is the centerpiece of the Cabrillo National Monument. The monument honors Portuguese explorer Juan Rodriguez Cabrillo. He was the first European to discover the San Diego Bay and chart the coast of California. On a clear day, it's worth a trip to the monument just for the views of San Diego and the ocean. Besides visiting the lighthouses, you can also go for a hike. You can also get a better view of the new lighthouse on your way to explore the tidepools at the beach, which are best at low tide in the winter. The National Park Service has restored the inside of the original lighthouse to its 1880s appearance. Check at the visitor center to find out about ranger-led talks. The lighthouse tower is open to the public three times a year. You can find the dates on the Cabrillo National Monument website. You'll also find an exhibit about both of the Point Loma lighthouses in the reconstructed assistant keeper’s quarters nearby. Sometimes, volunteers are on hand to recreate the past. They act as "Captain Israel," who was lighthouse keeper from 1871 to 1892 - or as members of the crew of Cabrillo's ship. The original lighthouse had a unique Cape Cod-style design. Unfortunately, the planning was so poor that the first-order Fresnel lens wouldn't fit it into the tower. A smaller lens replaced it. That may have contributed to construction costs which reached more than $30,000 in 1855 (more than $800,000 in twenty-first-century dollars) — much higher than the budget. For 36 years, the lighthouse stood at the entrance of the San Diego Bay, but in the end, the site was abandoned and the lighthouse moved down the hill. A new Point Loma Lighthouse was built closer to the water in 1891, only 88 feet above the water. You can see it from the Whale Overlook, 100 yards south of the old lighthouse. The new light looks more like East Coast lighthouses especially the Coney Island Light, Plum Island Range Rear Light, La Pointe Light, and Duluth South Breakwater Inner Light, all of which were built at about the same time. It is still in use but was automated in 1973 and converted to an LED lamp in 2013. You can see it from the road, but it is not open for tours. The lighthouse is inside a National Monument. You will have to pay an admission fee to visit it. The park is open most days of the year except for major holidays. Check the operating hours before you make the drive out there. Where Are the Point Loma Lighthouses Located? The Point Loma Peninsula is across the Bay from downtown San Diego. You'll find driving directions from all the major San Diego freeways at the Cabrillo National Monument website. If you're using a GPS, use the address above. By public transportation, you can take San Diego Metropolitan Transit System (MTS) bus 28 or 84C. They stop hourly at Cabrillo National Monument.